Why we keep buying new field guides. The golden age of large-mammal discovery has long since passed. Maybe that’s why the recent news that a police offer and car salesman from Georgia had found the body of Bigfoot was met with both predictable skepticism and a bit of discreet excitement. Nobody’s ever identified a Bigfoot before, so nobody knew exactly how to prove that what the men had was one, but the California-based Searching for Bigfoot, Inc., was willing to take a crack at the problem. The determination, it turns out, ended up being relatively simple. After buying the frozen “corpse,” the group initially observed that the fur “melted into a ball uncharacteristic of hair.” Further thawing revealed that the head was “unusually hollow in one small section.” An hour later, in the final and most conclusive test, an examiner touched the foot and discovered that, alas, it was made of rubber, and that what they had on their hands wasn’t a Bigfoot specimen, but a gorilla costume. 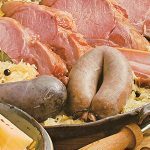 The newest version of Peterson’s classic guide. Fortunately not all species identification is as fruitless. In fact, while Searching for Bigfoot laments its false discovery (as well as, one assumes, the money it paid the Georgia con men), the nature-loving world is celebrating a milestone in the world of animal identification. This month sees the centennial of the man credited with creating the modern field guide, Roger Tory Peterson. The moment is marked with the release of the Peterson Field Guide to Birds of North America, combining for the first time the famed birder’s guides to eastern and western birds. Aids for attaching names to species, to be fair, existed long before Peterson was born. The bird illustrations of Alexander Wilson and John James Audubon are well-known, but their tomes were multi-volume sets too bulky (and expensive) to be taken on outdoor journeys. At 800 pages, though, Thomas Nuttall’s Manual of the Ornithology of the United States and Canada, published in 1832 and 1834, was small enough to carry into the field — its text and woodcut illustrations together make up what’s considered the first field guide. In a cruelly ironic twist, the identification of birds through the 19th century meant killing the very things being appreciated. It wasn’t until the conservation movement of the late 1800s (fueled by the rapid decline in birds at the hands of both collectors and ladies’ hats makers) that birders began identifying not with shotguns but with binoculars; Florence Merriam Bailey’s Birds Through an Opera-Glass in 1889 was the first guide to help them do so. Such books proliferated, but they relied heavily on text and few images. It was actually the 24 duck illustrations that writer Ernest Thompson Seton included in 1903’s fictional Two Little Savages that inspired Peterson 31 years later to create a guide that for the first time used text in service of images, and not the other way around. Bailey’s Birds Through an Opera-Glass. Peterson’s original painted plates, “digitally enhanced” in the newest version, attempt to present a holistic impression of each species; arrows point to the distinctive marks of each. In the world of field guides, this is one way of doing it. Other guides use photographs in place of artistic representations. 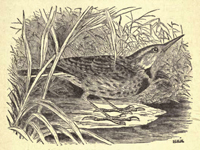 Photo fans claim illustrations can reflect the artist’s bias, and at the same time present an idealized version of the species as its never seen in the field; on the opposite side of the debate, illustration supporters contend that photographs present only a single specimen at a particular moment (perched? flying?) and against a particular background (sky? tree? wire? ), that could differ greatly from what’s observed in nature. Even so, field guides remain popular, both in terms of sales and in the number of titles available. Peterson’s guides alone have sold in the millions; other titles in the series cover coral reefs, North American mammals, and edible wild plants. But name almost any taxonomic group or any location, and there’s probably a field guide for it: consider Ants of North America, Marine Invertebrates of South Australia, Land Snails of Britain and Northwest Europe, Tiger Beetles of the United States and Canada, Texas Crawdads, and Psilocybin Mushrooms of the World (being, in layman’s terms, an international guide to shrooms). There are even guides to the things animals leave behind: Scats and Tracks of the Rocky Mountains, A Field Guide to Desert Holes, and, perhaps the most enthusiastic guide of all, Let’s Go Shelling. Yet field guides can at times feel like strange, almost anachronistic creatures. For all the digital enhancements and addition of 40 new species, the new Peterson guide feels almost like a throwback. There is no attempt to hide the brush strokes visible in many of the illustrations. The birdsong descriptions, though written in the model still used today, read as quaint — the “I SAY there or Quick three beers!” of the Olive-Sided Flycatcher, for example, or the “cheedle cheedle chee? cheedle cheedle chew!” of the Bell’s Vireo. The enduring popularity of hard-copy field guides is more surprising given the current transformation in the way we receive information — news through the Internet, say, or television on an iPhone. Publishers are clearly aware of these developments. Video podcasts supplement the new Peterson guide. 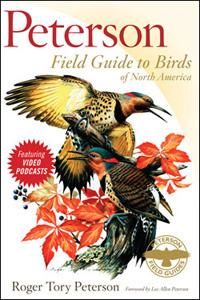 The Smithsonian Field Guide to the Birds of North America comes with a DVD of 138 birdsongs. And some guides, like eNature and FishBase, exist entirely online. Yet it’s the “throwback” that remains popular. Indeed, the Peterson guide comes with a price of $26; the video podcasts created to accompany it are available for free on the publisher’s Web site. 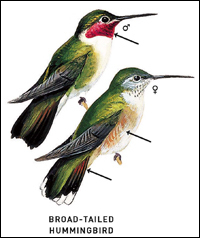 Male and female specimens in the Peterson Field Guide to Birds of North America. Identification is aided by technological bells and whistles, a recording of the Bell’s Vireo’s call, of course, being more effective than the word “cheedle.” But it’s only through the field guide page that the great biodiversity Weidensaul refers to can begin to be grasped. If, for example, one tried to identify a fall warbler, he would have to distinguish between Pine, Blackpoll, Magnolia, Yellow, Blackburnian, Palm, Hooded, Prothonotary, Mourning, Black-Throated Green, Black-Throated Blue, Chestnut-Sided, Bay-Breasted, Orange-Crowned, Yellow-Rumped, Prairie, Northern Parula, Canada, Tennessee, Connecticut, Nashville, and Cape May warblers, not to mention the Ruby-Crowned Kinglet (which isn’t actually a warbler but looks exactly like one), all presented on just two pages of Peterson. 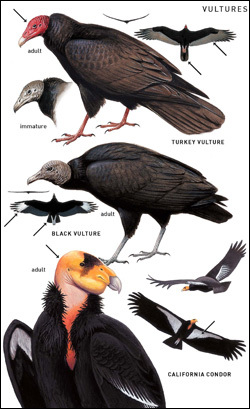 Ultimately attaching a name to the bird is a satisfying exercise (the Peterson guide includes a checklist of every species contained in the book, a “Life List” that readers can use to document which birds they’ve identified), as is the simple act of perusing a guide to any group or any location. Both make life seem a bit more understandable by making it seem a bit more classifiable. 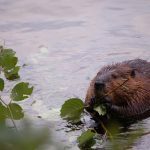 Guides do not, however, deceive their users into thinking that life is fully “knowable.” The National Science Foundation estimates that only two to 40 percent of the total species on Earth have even been identified. A true understanding of the planet’s biodiversity, then, remains elusive. Classify away and you’ve still only scratched the surface. This tension, between the desire to grasp life and its ultimate ungraspability, plays out on the pages of the field guide and in their use. 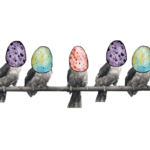 A bird flies away before its distinctive marks can be fully seen; the sun breaks through clouds and a specimen’s colors become difficult to discern; your partner heard a hoo where you are sure you heard a coo.